Free PowerPoint add-in easily makes project reviews for your clients and managers. Project software like MS Project, is well suited for managing, tracking and reporting on IT project resources and timeframes. But for reviews and project status reports, customers and business decision makers do not want to see the complex Gantt charts and complicated timelines that today’s project tools produce. Rather, they expect high-level status summaries and timeframes of the critical tasks and milestones, and they want them on PowerPoint slides. Office Timeline was built just for this kind of project status reporting. It is a light-weight PowerPoint add-in that quickly builds beautiful, professional project status slides for your colleague’s, client’s and leadership’s review. Since it builds slides with native PowerPoint objects rather than and image pasted into PowerPoint, they are easy to share with other PowerPoint users, who can modify them too. The tool makes it painless to revise, update and modify your slide once built. It was designed for high-level reviews, so depending on the size of your project, schedules may need to be summarized down to the most critical 20 – 30 milestones and tasks. It will add a ribbon into PowerPoint 2013, 2010 or 2007. There is a Milestone and Task wizard for capturing a projects important events or importing/pasting from Excel (requires Office Timeline Plus edition). Once the project data is entered there is a Style Wizard that makes it easy to do things like changing the colors and shapes, or adjusting the time scale of your timeline from days to weeks, quarters, months or years. Also at any time you can choose a different style of template and all your data and style preferences are rendered instantly in the new style. 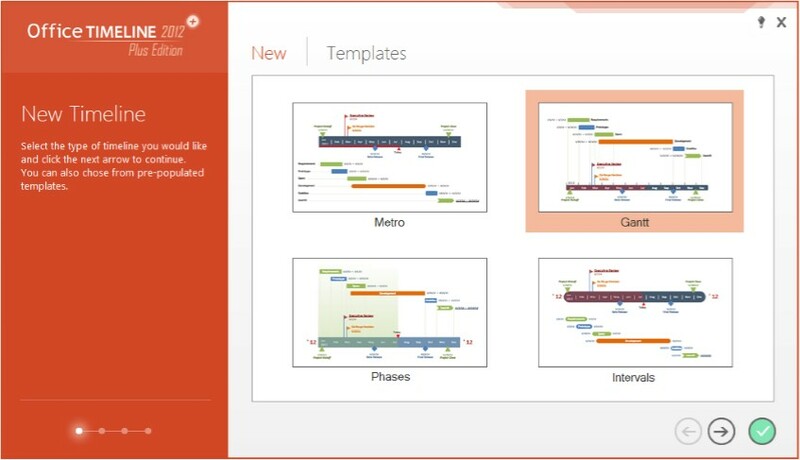 In PowerPoint select the new button from the Office Timeline Ribbon which will launch the template gallerybegin guiding you through the design and set-up of your project slide. Select your preferred style from a template gallery and proceed. Now enter the project plan’s top Milestones and Tasks, and their dates. Also make style choices about the shape, position and color you want their respective objects to be. Then hit the Check icon to create the slide. Once built your slide is not static which is useful since unexpected changes happen often, particularly to IT projects. If your project has glitches, delays, or the schedule was built on incorrect assumptions, you can quickly make changes to update the slide from the Office Timeline ribbon in PowerPoint. Simply edit your data or style choices, click accept and to slide instantly rebuilds itself. Great tool! I just installed and made nice little timeline. Pretty easy to use. Would be nice if they had a few more templates. Thanks for the article.